I wrote this post on our way to Ireland four weeks ago with great intentions to post it during our trip. So much for good intentions. I’m posting today because I still think this is good information for anyone considering a summer trip to Europe – it may be worth your while to wait until next April to get more for your travel dollar. My kids plonked themselves into their seats for the flight from Chicago to Dublin, with their attention distracted by the bright in-flight entertainment screens they started investigating the menu of movies leaving me standing in the aisle with three carry-on bags to put away and a line of impatient people building up behind me – or so I thought. I struggled mightily to lift all three bags into the overhead bins. Once done, I expected glowers from the passengers behind me but all I got instead was a calm “No rush, no rush” from the one person who’d been patiently waiting for me to finish and then I noticed that there really weren’t very many passengers lined up in the aisles waiting to find their seats. We travel between the U.S. and Europe so that our children can grow up knowing their extended family – most of whom live in the British Isles. We try to spend time there at least once a year and I bargain hunt for airfares to allow us to do so as economically as possible. A number of times in the past few years we’ve opted to spend Spring Break in Europe and I’ve come to believe that this is the best time for transatlantic travel for budget-conscious families planning a European vacation. 1. Cheaper Flight Costs. As I’ve mentioned previously on this blog, Farecast’s 2008 study shows that airfares to Europe are up to 150% higher in July and August than at other times during the year. We paid $770 for return flights from Seattle with United and Aer Lingus. 2. The Flights Are Less Busy . As I mention above, our flight to Ireland was only half-full. There were plenty of empty seats in coach allowing us to spread out and be more comfortable. CAM, who’s almost 14, is currently a gangly mess of elbows and knees. I was not looking forward to sharing the narrow confines of a coach-class row of seats with him. Instead, I had two seats to myself and he had plenty of room to stretch out. 3. Local Spring Events . American Spring Break usually falls on or around the same time as the European Easter holiday. Just as in the U.S., the schools are closed and it’s a popular time for families to take a short vacation. You’ll find fun local festivals in many towns and cities. When we’ve traveled at this time of year we’ve also enjoyed shorter lines at larger attractions and lower accommodation costs. 4. Spring Weather. The weather can make or break any vacation. In April, temperatures are moderate in most of Europe so you need to be prepared for some rainy days. That said, the trees are starting to turn green, spring flowers abundant and, in Ireland anyway, there are sheep and lambs all over the place. 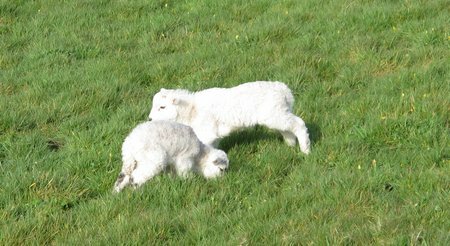 I’m finding I’m compelled to photograph “the cute sheepies” every time I see lambs in the field – to my husband’s growing frustration. I’m sure there are other benefits I’m not thinking of. If you’ve traveled from the U.S. to Europe during this time of year, do leave a comment below and share your experience. This entry was posted in Family Travel Tips and tagged Budgeting, Europe Spring Break on May 3, 2010 by wandermom. Thanks for explaining the best times for travel in europe. Great list. Thanks for posting.